In this project, I investigate how tribal ICT champions command the build-out of Internet infrastructure for reservation communities. This project reveals three major findings: 1) the histories of ICTs are intertwined with histories of colonization, sovereignty, and self-determination; 2) tribal leaders command the build-out of Internet infrastructure toward the self-governance of their peoples; and 3) the process of network design and deployment embeds these infrastructures within the ongoing negotation of the sovereign rights of tribes within the U.S. This project also reveals layers of colonial logics shaping studies of ICTs in Native and Indigenous contexts, and identifies the basis of Indigenous sociotechnical visions for Indian Country. Reference: Duarte, M.E. 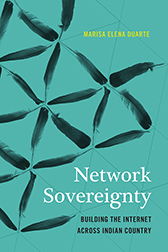 Network Sovereignty: Building the Internet Across Indian Country Seattle: University of Washington Press, forthcoming. Reference: Duarte, M.E. Network Sovereignty: Understanding the Implications of Tribal Broadband Networks, [dissertation] University of Washington, Seattle, 2013. Reference: Duarte, M.E. Network Sovereignty: Building the Infrastructure Toward Intellectual Freedom in Indian Country, School of Library and Information Studies, University of Wisconsin, Madison, April 18, 2013. Reference: Duarte, M.E. "ICT4Sovereignty: History, Access, and Terrain in the Innovation of ICTs in Native America," Resistance and Technology Roundtable, Association of Internet Researchers, Seattle, Washington, October, 2011. References: Duarte, M.E. Effective Strategies: Building the Internet in Indian Country Association of Tribal Archives, Libraries, and Museums Digital Inclusion in Native Communities Summit, Washington, DC, September 9, 2015. Co-Chair: Tribal Telecom and Technology Summit. Co-chair: Brian Tagaban. Chandler, Arizona, February 2014. Reference: Duarte, M.E. E-Rate, Intellectual Freedom, Digital Natives: Broadband Internet for Tribal Libraries, Washington State Libraries Council, Seattle, WA, May 31, 2013. This research was supported by the Information School at the University of Washington, a Dissertation Proposal Development Fellowship through the Social Science Research Council, the Mellon-Sawyer Predoctoral Fellowship through the B/ordering Violence seminar at the University of Washington Simpson Center for the Humanities, and through the Chancellor's Postdoctoral Fellowship in American Indian Studies at the University of Illinois, Urbana-Champaign.